The Arizona Soccer Association announces the 2019 Arizona Adult State Cup which will feature Men's Open, Men's 30 , Women's Open, Women's 30 , and COED divisions. The upcoming 2019 Adult State Cup will be held from March 15-17 at Reach 11 Sports Complex, the largest soccer complex of its kind in Arizona. "Last year's Adult State Cup was a tremendous success and all of the teams enjoyed playing at a premier soccer complex like Reach 11," said Garrett Cleverly, ASA Director of Communications. "We will have a few more fun surprise announcement regarding this tournament and we'd like to thanks Dan Trainor and the ASSA board and staff for their help and support of the 2019 Arizona Adult State Cup." Team trophies and cash prizes will be awarded to the champions of each division. To register your adult team for the 2019 Arizona Adult State Cup, please click here. Registration closes March 1, 2019. 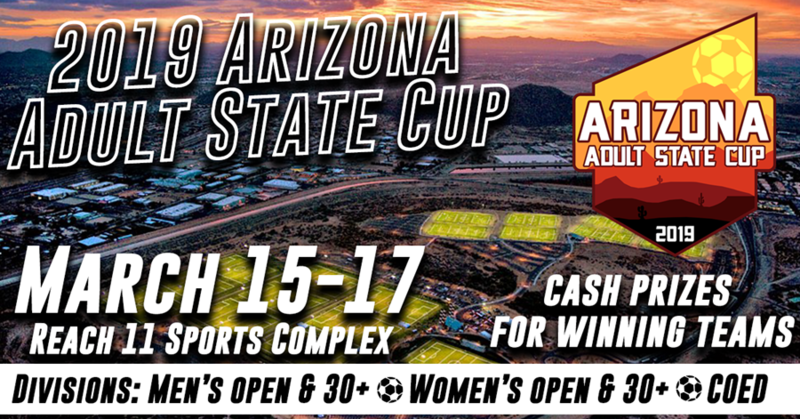 For more information head over to the 2019 Adult State Cup homepage or call us at 602-433-9201. ADULT TEAM/PLAYERS: All adult teams must enter and register for the 2019 Arizona Adult State Cup prior to March 1, 2019.